Founded in 1814, this charity-run housing, like the two other examples in Rotterdam, originally began life at another address. In fact it has had to move twice, first in 1864 from Oostsingel when a new street was laid out and then in 1900 from Weenaplein for safety reasons when the Hofplein Viaduct was built. 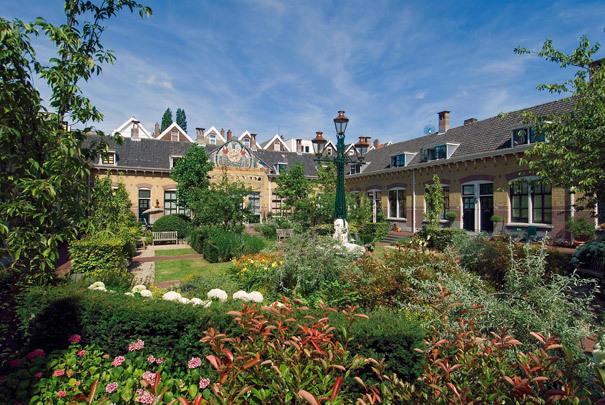 Since 1902 the almshouses have stood at Vijverhofstraat in a U-shape of 16 houses round a garden. The tile picture on the facade above the trustees' room, now a meeting room, is a survivor from the first address. It shows a pair of demonic figures being driven away by two angels leaning on a clock.